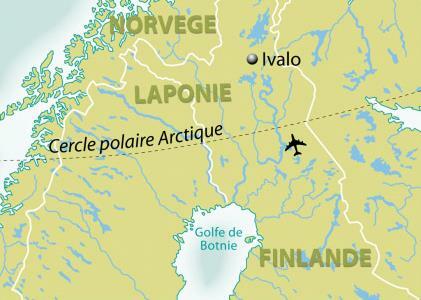 Dear Friends, I have promise to translate a recent trip in Lapland (Ivalo lake). All three guys have learned a lot on this forum so we want to give here some report about the trip. Special thanks to HOOP. We are three guys (France and Belgium) and only one of us had a good experience of winter trekking in lapland prior this trip. 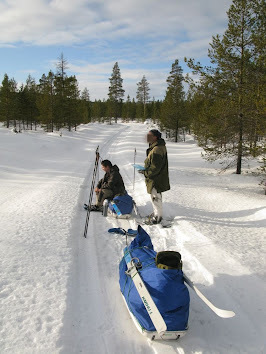 Two others had good experiences of winter bivouac but not in those flat and cold forests of far north in winter (less than 5°F). We wanted something "simple" without Goretex or full synthetic gear. Part of the trip is under tarp (cold and fire camping) the other part is in cabin or leanto. Questions are welcome and I will try to give responses. Finnish Lapland: Synopsis of the trek "Winter in the Arctic"
Arrival at Ivalo airport in the morning, after an exhausting journey (one came from France, second from Belgium, third from Holland). The whole night passed in correspondence to the Helsinki airport has not been more relaxing. We recover quickly luggage and go through the common to share our traveling clothes by those of outdoor travelling. We will leave a small bag "return to civilized man" to set the hotel. Directorate taxi and run by a fuel pump in order to fill our fuel reserves (3X3l on the base of 300ml per day). A little later, the same taxi drop us off with our equipment on our starting point. Finally, here we are! Time to load the sleds and snow shoes and and we are on the way to our first camp. A stop in Hudson Bay after a 30 minutes walk, as saying adventurers rush to the Klondike. (Something that will be very useful soon). The installation of the camp is followed by a reorganization of fashion bags "airplane" mode to "travel". We put out, night falls quickly and we imitate to perfection. We chose it as a base to a lean hard: in fact half teepee wood fire with a place. Day "Departure." Clock on 6:00 followed by a full day of progression menu. Here was the theory. Already, the alarm remains silent, making us an hour late in the slats. And barely an hour after we started, we broke two pairs of rented snowshoes (no mark, third snowshoes were nice Tubbs) ... We need to turn around, contact the rental (Sunday) and we have it delivered by taxi equipment spares. Half a day in the slats and the obligation to re-bivouac on our starting point. Grrrrrr. Let ZEN, sky has decided, and he must have his reasons. I spend a few hours in the afternoon light to train the skis (old 95mm binding nice with Nokian Naali of finish army) on the lake. Cool evening around a campfire without auroras due to overcast sky. Sunrise with an alarm clock that works. The sleds are heavy legs still lapped and the way very long. Fortunately, scenic beauty and motivates km accumulate. En route we passed a "local" who advises us to change our route a bit. This is a year with a lot of snow, it is not enough for our sleds and carrying our snowshoes. 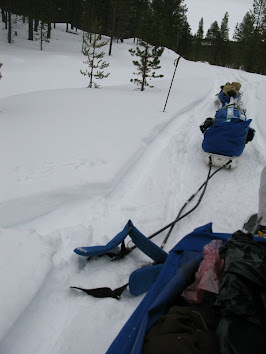 (We sink to mid thigh off the track despite snowshoes ...). Change the mapping lightning speed: Reactivity = Security. We will ask our bivouac area in a rather windy (aprox. 30mph) but not so cold . Night falls , already 6.PM and it is a big job. A lot of time is necessary to prepare our cold camp Arctic (no fire). Temperature is too high (perhaps 20°F) for the season and finds himself wiggy's (superlite) do the job alone. So I'm naked in the bag, waiting feet firm (and own) the aurora borealis. The tarp is oriented, it only remains to wait. Result: I fell into the arms of Morpheus before the arrival of these ladies colored. Goal is a hut where we will spend the night. Along the way, we will be entitled to snowfall and scenic beauty, good morning backcountry snowshoeing and one afternoon we spend skis feet. Upon arrival at the cabin, it will be an evening of “waitress”. Cleaning and drying equipment that must be. Maintain to keep! The sky is too overcast to see the aurora ... They begin to chase me the aurora! Early start for a day walk on water. After a few kilometers on land, in fact we cross our first big lake. Journey that will seem interminable to view weather conditions encountered. Snow, sleet and whiteout that I do not feel absolutely moving. In the middle distance, while I'm sitting on the pulka to drink a cup of tea, a skidoo out of nowhere. It cuts our track perpendicular while slowing down, and after a sign "OK?? "He started a nice curve while spinning full throttle in our sense of progression. It gratifies us, in so doing, a royal road well groomed by the power of his caterpillar. Upon our arrival, and after installation of our camps, we make a bonfire. The material is pierced and froze on us (one has anorak of Ventile material, the other Buffalo Pile&Pertex, third oil cloth Barbour. All is wet with wet snow and only 30.2°F). Stephane in is barbour (He likes a lot simple gear). Snow sofa for outdoor evening. we prepare an Open fire. Night under tarp. No gsm network to communicate our position, so no news today will go to Belgium. I know that will bother ... 7:44 PM, flat, dark, DODO. We take the road early this morning as a long stage before us. We cross two lakes and a mound of separation. It is one that imposes portages during successive lakes. We travel in tractor snow mode, and it rises gradually. At the end of the day, hut Rautujarvi is reaching, and especially his stove. 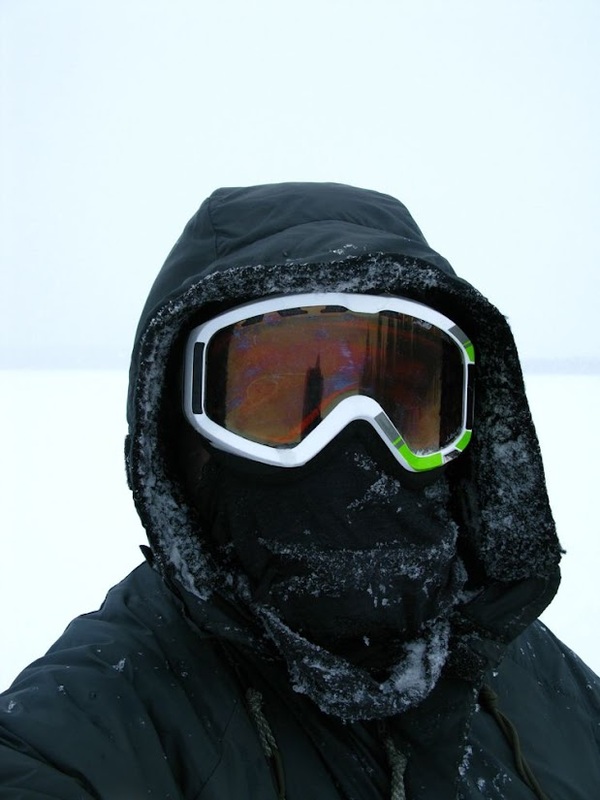 Temperatures: -4°F, overcast sky, evening "chatting corner stove" Info: Change the batteries in the GPS. Up early, and just out of the cabin, nose hair are instantly frozen. 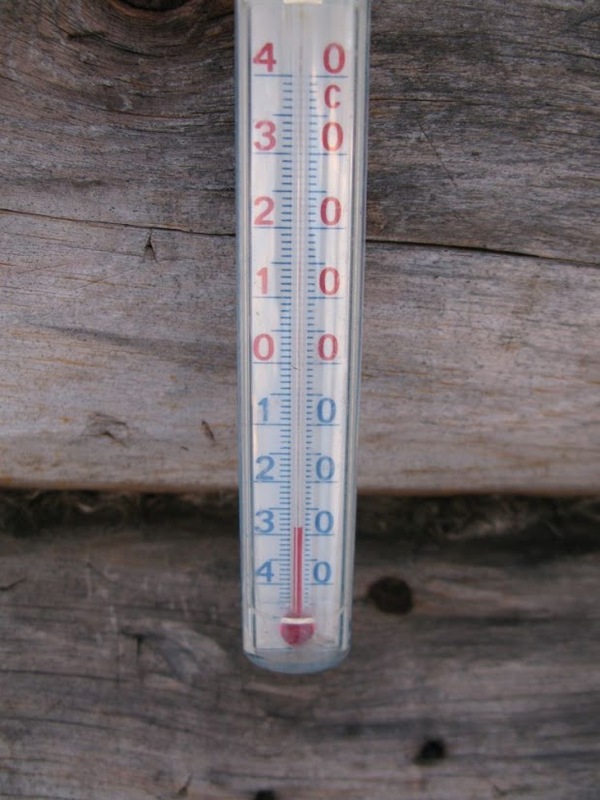 A glance at the thermometer confirms the feeling: it is -30°C, -22°F. The sky is completely clear, red sun is reflected on the lake ice in shades of white, blue and orange. Big day maintenance and repair of equipment. Felt slippers holes are repaired. The ripped leggings is sewn, T shirt thread receives the same treatment, and everything is washed and dried. A good session clearing the man is also executed. The evening will be around a plate of smoked duck breast with pasta cooked masterfully by Didier. 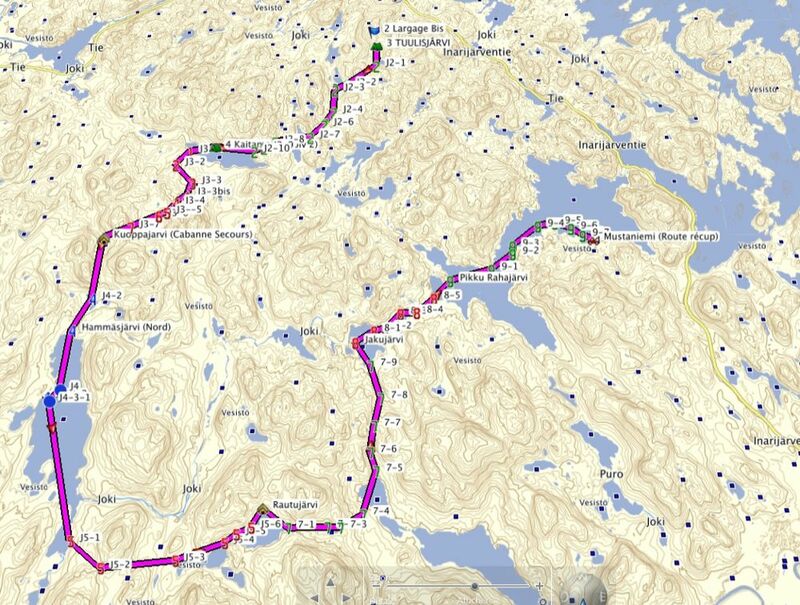 An early start for a day of progress that will get us back in the suburbs of Ivalo. Perfect day, the sky is clear, and beautiful scenery. The temperature is ideal for a day of effort, a -13°F cold and dry for sending watts without ending up soaked in sweat. We will ask our bivouac by the same weather, then the thermometer will plunge. Alcohol decides to be fussy in the glass ball and go no more out until the next day in the morning. The only indication is that the night will be passed to a temperature which does not above the remonstrated -30°C (lower limit). This was beefore going to sleep, probably the temperature was less during the night. All Wiggy's / Walden (200g 850cuin down quilt bag) spends his test successfully. Vincent sleep like a baby. It was the same for Didier (800g 850cuin down bag + 600g 650cuin down bag) and Stéphane (valandré Odin sleeping bag). The dismantling of the camp is very long, every gesture must be considered and has an immediate cost in case of error. The metal is unforgiving upon contact and plastics behave erratically. A test that says a lot is done by Lambda water thrown in the air freezes before falling to the ground! Two hours later, we are in our recovery point. The taxi is in sight and it's the end of our expedition. We're all a little grogi in the taxi ... Then this is the hotel, shower, sauna and great food that enchaîneront. A good night in a real bed and a thermometer 20 in the morning. End of our travel ... The next one is already in mind, remains to mount _ ((_. Awesome looking trip Pyreneo, I'd love to ski and camp over there, although in Norway for me but money wise that will never happen. How many kilometers did you cover in all? I really like the little cabin you had on day four. I'm surprised to see a Wiggys sleeping bag being used in Arctic Finland. Do you remember how long the skis were, they look really long to me? Why on some of the pictures are the skis strapped on the pulks and not on your feet? On day seven when everything was washed and dried, how or where did you do that? Great trip, nine days in the far north of Finland must have been great. Awesome looking trip Pyreneo, I'd love to ski and camp over there, although in Norway for me but money wise that will never happen. How many kilometers did you cover in all? Approximately between 60 and 70 km. I will ask to my friends who have GPS (normally approximately 4km/h a little more than 2 miles/hours). Thats Finland and more generally Scandinivia : nice huts, free, very very clean, no destructions by peoples, respectuous habits (always small wood and firestarters in case of emergency), sometimes garbage can (in winter ! 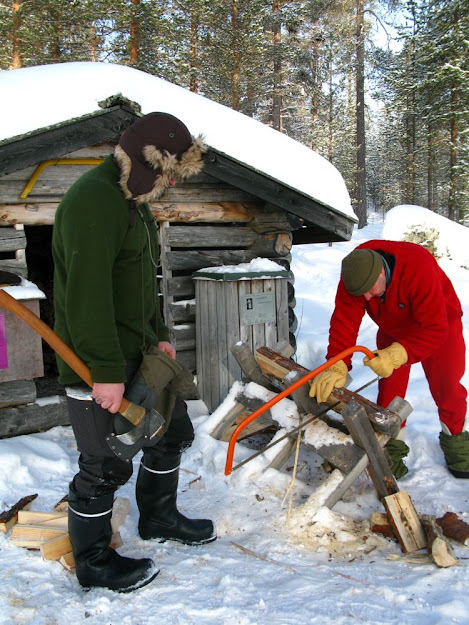 ), normally wood and tools (axe and saw). Even when nobodies lives around (20 miles), these place are not for sleeping except if you have not motor. I'm surprised to see a Wiggys sleeping bag being used in Arctic Finland. We had good reports on wiggy's, specially from military people in opex. Vincent decided tu use a combo quite light : wiggy's+down. 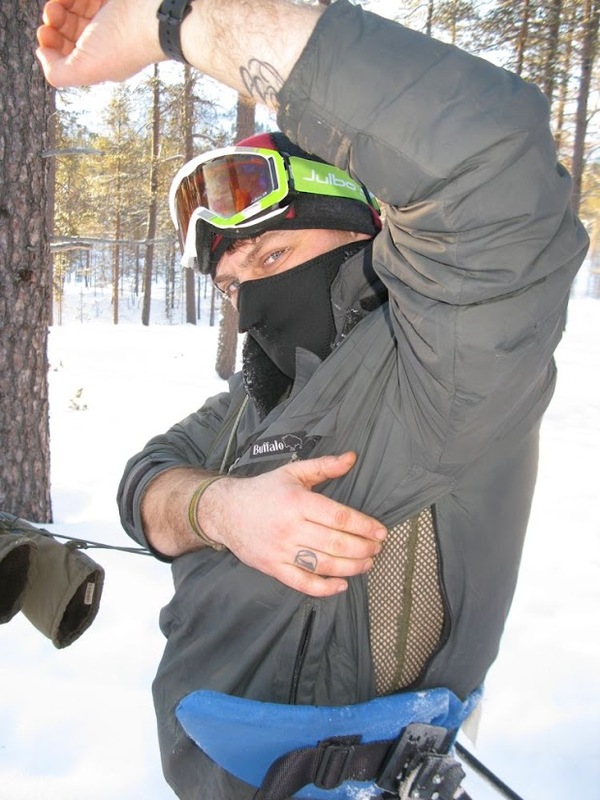 This idea came from scandinavian sleeping bag brands like helsport (well known in Europe). Do you remember how long the skis were, they look really long to me? This is "forest ski". We have rented them, approximately 6 feet (1.80m). Why on some of the pictures are the skis strapped on the pulks and not on your feet? Our goals was to test different solutions. Two of us had some experience in Alpin ski, but not a lot in telemark ski. Normally Nokian Naali could be used with scandinavians forest ski (old 95 mm binding). We found that it was easier to use snowhshoes than skis. Lot of snows and certainly the fact that we had no skins for the skis plus not enough practises. On day seven when everything was washed and dried, how or where did you do that? We were in a hut with a good heater and wood near. The temperature was quite good inside and It was easy to have water from snow. Vincent used synthetic underwear (netsuit, briefs). This need only few water and soap to clean it and after few hour it was ok. We used a small folding bucket. I used wool underwear (aclima woolnet+woolpower 200) wool shirt (pendleton), wool briefs (Devold), wool socks (smartwool), woolrichs wool pants+wool bottoms+light camo white cotton pants...so odour was not a problem. I need only two set for underwear/socks. Great trip, nine days in the far north of Finland must have been great. Of course It will be nice also to go to america : but It is far more complicate (and expensive). Is the reindeer skin tanned, or just dried? Thanks. Commercial ones as you could easily find in lappland. So I think this is tanned in a modern way. 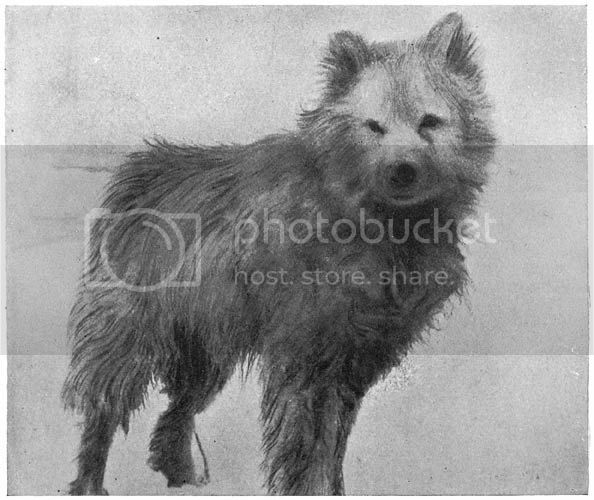 But you could find different quality, this one is a good one. Adavantage of reindeer : very warm, idiot proof, need only gross motor skill and If you put some water on it...only wait for freeze and then brush it. Good idea on the folding bucket, I've been looking at them on the internet. I like the ability on extended trips to wash underwear, long underwear tops and possibly long underwear bottoms and socks or to take a sponge bath with and at only 80 grams for a 10 liter or 110 grams for a 20 liter bucket they are lightweight for their usefulness. I might buy one. Hello Pyreneo: Amazing report!! Beautiful pictures! !My dad is from Finland. I will get him to check out the report. If you did the trip again, would you use wide traditional snow shoes and toboggans instead of modern snow shoes and pulks? I used a pulk on my first trip and found it difficult to haul. I find the toboggans to be much easier to pull. Was anybody wearing wool pants? I find them to be so much more practical than other types of pants. Very poetic! Looks like a great trip, I really enjoyed the photographs. What type of snowshoes were you using, that you would be sinking that much into the snow? Hello Pyreneo: Amazing report!! Beautiful pictures! !My dad is from Finland. I will get him to check out the report. 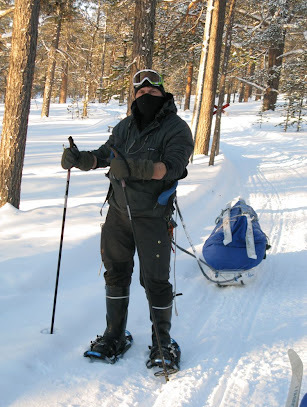 If you did the trip again, would you use wide traditional snow shoes and toboggans instead of modern snow shoes and pulks? I used a pulk on my first trip and found it difficult to haul. I find the toboggans to be much easier to pull. 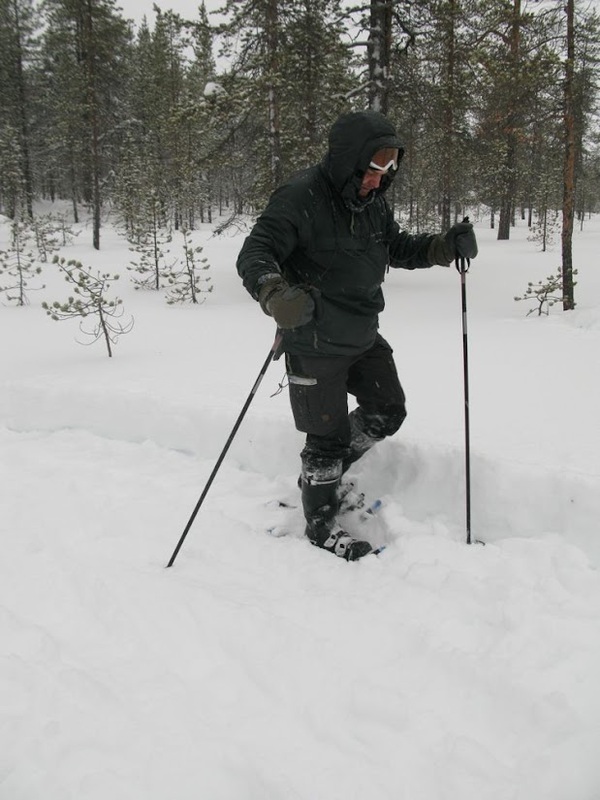 It is not easy to find traditionnal snowshoes in Europe. They are quite useless in our steep mountains with sun which could modify snow rapidly and you have not enough grip (europeans snowshoes are generally different from Tubbs or MSR. But you could use these in European moutains). It is the same problem with toboggans : you could use it only in flat land. But, we have already thinking of these solutions if we have to go back in Finland or Sweden. 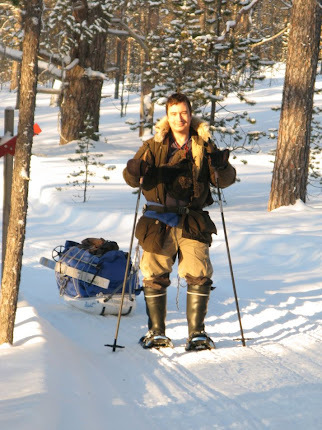 Traditionnal snowshoes are the best with deep snow and you could pack toboggans and they are better than pulka in deep snow and we likes Connover's way). Was anybody wearing wool pants? I find them to be so much more practical than other types of pants. I used an old woolrich pants found in second hand store. They are not easy to find in Europe. They are very nice but you need freezing temperature and not a lot of wind. They are not great in high mountains with wind and sun (and they are heavy). Here on the right it's me. I have a big ventile anorak and the red wool pant inside Nokian boots. My friend had a down woolrich parka and a combo woolpower200+fjallraven G1000 pant. Here : Vincent with also fjallraven pant+woolpower200 and woolpower400 (+chapka). I have the red woolrich pant and the HH pile. 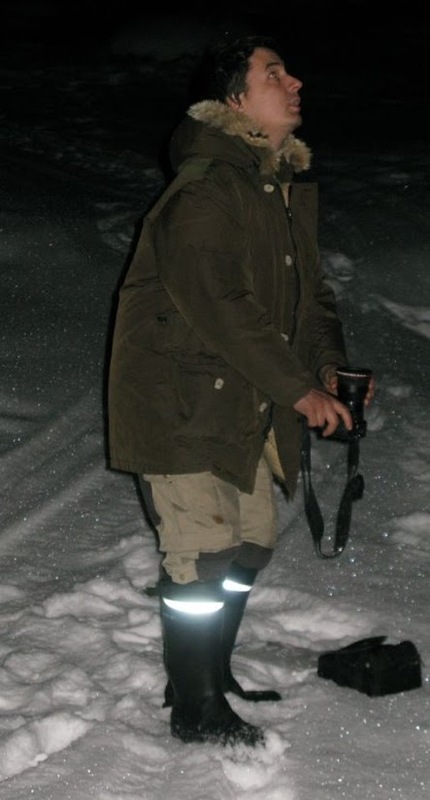 I had a small problem since my pant was in the nokian boots : so, some snow could get inside boots when we had deep snow. Normally I would use gaiters and boots instead of Nokian Naali and it would be perfect. For this reason during hot part of the trip I prefered use this combo : woolpower200 bottoms+ thin white cotton pants from bundeswehr. Here in cabin my red wool pants (with suspenders of course) and my black western pendleton wool shirt (very nice with snaps instead of buttons when you want to ventilate quickly under the smoke/anorak. Little trick : I put some liquid PU (shoe goo) on the reverse of metal snaps to protect the skin of my wrists from cold beat from metal.). I have also helsport "footsack" in this picture. I used 30" snowshoes from Tubbs. My weight is 164 pounds, so it would be big snowshoes for me in Alps. but during the trip i had snow to my knee. They had lot of snow this year and with their very low sun (we are very far in the north something like Baffin island in Canada), flat land, certainly low winds and constant cold : snow was very dry. It was impossible to make snowballs. Sorry : I don't know the english technical term for this typical high altitude snow. I am not sure about "powder". Thanks for posting that trip Pyreneo! Lovely landscape. I really like that Finn-Scandinavian culture of open huts that people look after and use with respect, because respect for travel on the land and fellow trekkers is part of the culture. Here, huts like that would be vandalized, or someone would just move in! Our governments tend not to build them either - just high priced resorts, so its always refreshing to read about the common culture of sharing the huts. If you add climbing skins to your skis, even kicker skins (since they may not make full skins for those long forest skis? ), it makes a huge difference. I just got back from a week long base camp trip, and both my sled hauling, and day trip free skiing breaking my own trail in deep dry snow required kicker skins to get a grip. I can also recommend the biggest snowshoes you can find - they cannot be too big. 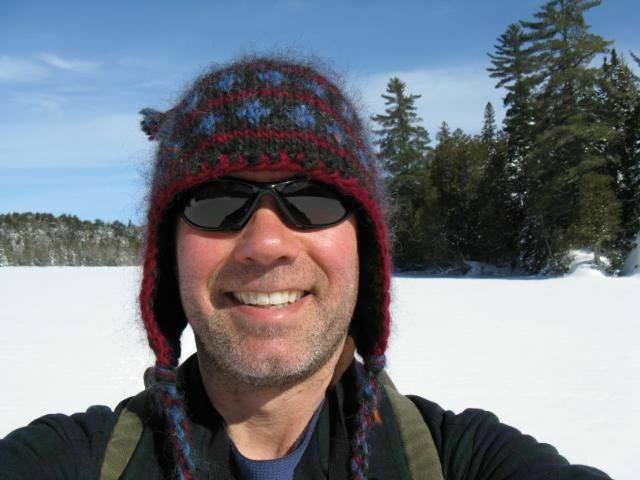 I am a small guy, and I use big snowshoes and have no problems maneuvering. I agree that crampons are needed for the conditions you had with hills. I own a 10x36 Faber synthetic, which was the biggest on the market when I bought it, and could not imagine using anything smaller, even though I weight only 150 lb's (without gear on). GV now makes a 12x42 which I plan to buy when I get some money maybe next season. I find that both here and in Europe, sales people and outdoor writers tend to recommend smaller snowshoes for adults. 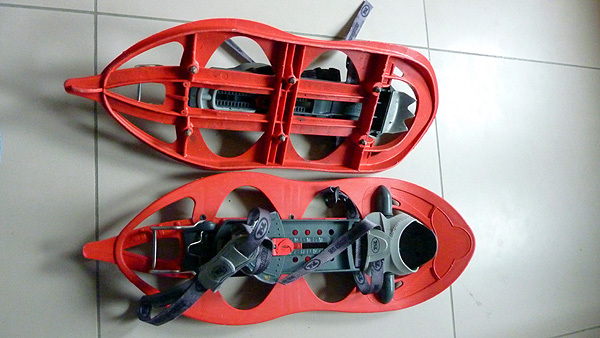 I think the biggest synthetic snowshoe made is the one for trekking because you can travel packed trails, and the step off into the deep snow and be fine. I am also going to check out the new bindings made for tradtionals that have crampons. I think a big traditional bearpaw with fine weave and crampons would be ideal. Anyways, thanks again for sharing the trip. We look forward to more! Thanks you for your kind reply.